Note that the 1500 MW of wind facilities produced less than 50 MW of electricity for eleven and a half days, and under 10 MW for eight and a half days. Wind power would be the equivalent of our returning to a hunter-gatherer society. A picture is worth a thousand words, they say, and doesn't get much more verbose than that graph on the utility of wind. Is the almost two weeks of almost no power generation due to weather conditions (i.e. lack of wind) or maintenance (planned or unplanned)? No wind and strictly unplanned. You might be interested to know that the stimulus bill allotted $3.25 billion in extra borrowing authority to Bonneville Power Administration. They said they plan to use the money to build more transmission lines. It would be interesting to do a straight ROI analysis for this given this data. For example, if a wind turbine cost $2 million, to make back the $2 million and then finally start making a profit, there would have to be X amount of kWh generated per day to keep pace with the expected ROI. For every day where no electricity is generated then that will set back the ROI schedule or place a greater output per turbine to keep on track for the ROI. So in other words, how or why would anyone want to put an investment into an energy source that is as fickle as the wind? Proponents may say that collectively the wind is always blowing, thus to make the investment less risky, you have to place bets on many turbines to accumulate an expected (an optimistic) generation rate of 25% of collective capacity. I don't know the details of the subsidies that wind is given, but my hunch is that without those incentives, wind power is a no go. This was basically stated by T Boone Pickens before. T Boone got into the wind game because of this, the risk was reduced to nil for him and if his "plan" worked then it would provide a huge new business for his gas sales. 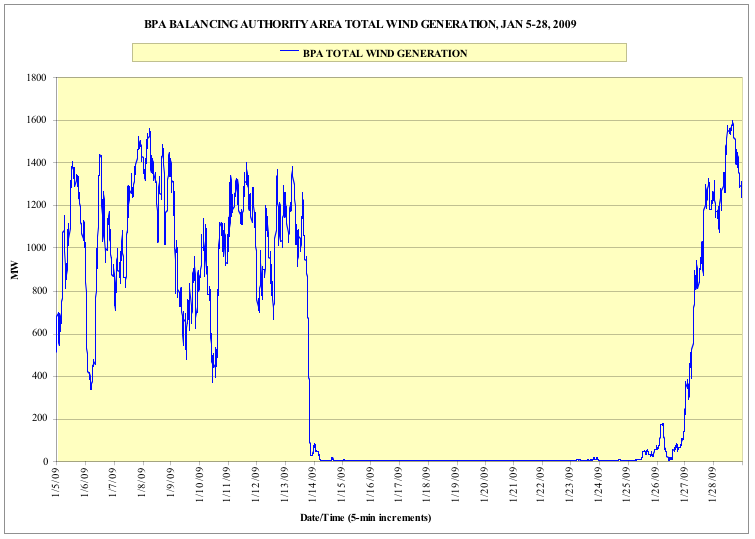 If I'm reading www.bpa.gov/corporate/about_BPA/Facts (.pdf) right, for the BPA — unlike most places — the intermittency of wind is pretty much a nonissue. They have 12 GW of hydro capacity but only produce an average of 7 GW — presumably that's all the water they have. Every kW-h of wind allows them to generate an extra kW-h of hydro when they want it. So 1.5 GW of wind is worth ~0.5 GW of nuclear power. Bill, the real point of the illustration was to point out exactly how intermittent wind can be. But if wind displaces hydro, and nuclear - they also transmit power from a reactor - then there is no carbon saving from wind at any rate. @Bill, it's interesting how two people can look at the same thing and see something entirely different. The BPA document you linked to doesn't even mention wind energy, so if you want to count that as a "non-issue" then you're right, they made no issue of wind nor its intermittency. Wind is known to have an average 25% capacity factor and nuclear hovers around 93%. You can look these figures up on the EIA website to prove it. No, I mean the capacity factor of their hydro seems to be only 60%. So whenever a MW of wind comes along, they can grab the chance to turn down the taps, saving water for later. That's even better than pumped hydro storage, because they don't lose power pumping back uphill. That's how Denmark manages to claim they get 20% of their power from wind — when it blows, they export power to Norway and Sweden to replace their hydro power. When the wind doesn't blow Denmark imports equivalent power back. "Wind is known to have an average 25% capacity factor and nuclear hovers around 93%." Bill, if the document you linked to doesn't even mention wind energy, then how can you assume that a gust of wind will save any water? Wind power already supplies less than 1% of the total electricity in the USA. What you're saying makes no sense. Denmark, with only 5.5 million people, still generates most of its electricity with coal and it also has some of the highest if not the highest electricity prices in the world. Demark's claim of around 20% for wind is not a stretch as they have around 3.5 GW of wind capacity installed so they are probably get around 700-1200 MW net generation on average from that. Gas, coal, oil, and imports must make up for when the wind is not there. I don't agree with your math technique, but I think your trying to gauge one against the other but the way you phrased it makes it sound like wind energy beats nuclear as a generator. It doesn't and never will. 375MW is .25 of 1500MW. That's the AVERAGE annual generation capacity of wind. 1500MW nuclear at an average annual capacity is 1395MW gen. power. By toying with those numbers any further is making funny math. I live in the area from where this wind generation curve originates. We had air stagnation warnings on those days. This happens just about every winter. Note that power demand here peaks in winter due to a large of amount of electrical space heating (I have a heat pump, and so contribute to this peak). At peak times, the flow of power on the Pacific Intertie (high voltage DC line) is reverse (power flows from Los Angeles to The Dalles, Oregon, instead of the opposite way). Perhaps the lack of wind generation didn't merit a mention by BPA because just prior to this we had a substantial melt-off of large amounts of snow, so there probably was quite a bit of water available to run through the dams to make up for the shortfall. On the other hand, there was at least one day last year when winds at all the wind turbine site in the area were quite high, where the generation threatened the stability of BPA's grid. And by law BPA is forced to accept all wind generation, stability be damned. Is the blog about nuclear or about wind? Why cannot the nuclear boys just focus on their tech? I think the odds for you would improve greatly!